The entire luxury goods market in the United States was valued at 178.9 billion U.S. dollars in 2017. As far as advertising is concerned, North America is one of the three global regions where luxury advertising spending is expected to exhibit positive growth in the coming years, with expenditures projected to grow by four percent in 2018 vs. 2017. 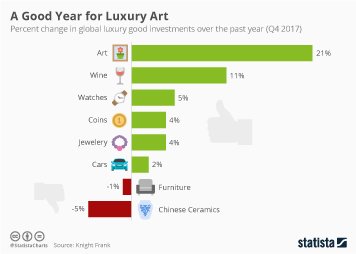 Luxury cars are believed to account for the majority of advertising expenditures in the region between 2016 and 2018, followed by fragrance and beauty, watches and jewelry, with apparel holding the smallest share of luxury expenses in the period. In the United States, luxury ad spend is forecast to increase from 4.87 billion U.S. dollars in 2015 to nearly 5.5 billion in 2019. That year, TV and digital are forecast to be the primary media for luxury ads based on spending. In 2018 rankings of the most valuable luxury brands worldwide Louis Vuitton placed first, with a recorded value of 41.14 billion U.S. dollars, followed by Hermes, Gucci and Chanel. Furthermore, in terms of social media marketing, Chanel was also the leading luxury brand on Twitter and Instagram, with 25.3 million Instagram followers and 13 million Twitter followers. At the same time, Facebook was dominated by the Louis Vuitton brand and 19.43 million fans of its profile. Dior was the second most popular luxury brand on the social network. In line with the growing usage of digital media among luxury advertisers it comes as no surprise that the majority of them admit to utilizing social media influence marketing in their campaigns. Additionally, 15 percent more have plans to start using this method in the near future. Most luxury brands indicate that influencers actually play a critical or at least a very important role in product launch and content promotion. Subsequently, the top method of ROI measurement cited by luxury brands using influencers was the generated web traffic and volume of shared content. On the consumer side of things, the leading source of new luxury brand discovery varied per age group. For 18 to 26 year olds their main source was social media, at 42 percent, while 27 percent of consumers aged 27 to 34 year old indicated word of mouth as their primary source of discovery. The 35 and older demographic reported they learned about new luxury brands from print magazines. Topic: Advertising agencies in the U.S.